TB 178cc Big Bore Kit, Race Head V2, and Intake Manifold Kit – This is the final step in power gains as far as cylinder size goes. 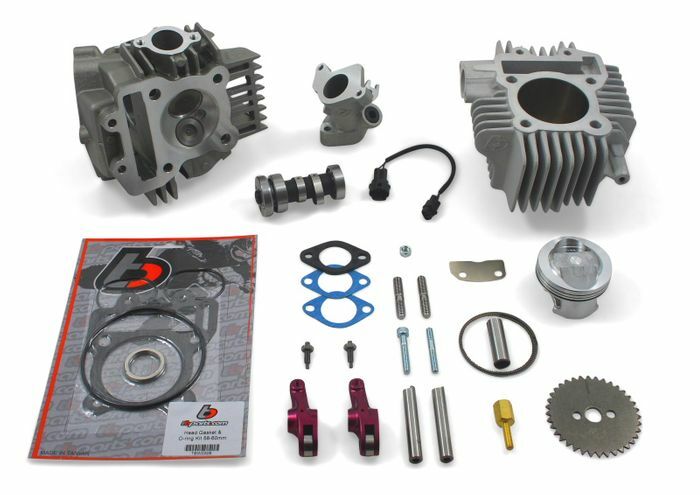 Like the 165cc kits, installation of this kit requires engine dis-assembly and case boring. The engine cases cant safely be bored any bigger and for this 67mm cylinder, you definitely will want an experienced shop to bore your cases. You can also add a stroker crank and take it up to 194cc – Massive power! This kit is for the serious racer and if just looking for more fun on your Z125, we recommend the either the 143cc or 165cc kits. 67mm Ceramic coated all aluminum cylinder (no steel sleeve) Lightweight high compression 67mm piston with rings, pin, & clips (will safely run on pump gas, 90-93 octane) Head gasket kit – Now includes the cylinder head o-ring set and an exhaust gasket. The all aluminum ceramic coated cylinder is not only lighter than a steel sleeved aluminum cylinder, it is harder, reduces friction (increasing power), improves sealing, and provides better heat transfer (runs cooler and cools down quicker). This kit requires case boring for installation. Forged anodized aluminum roller rockers Huge 30mm intake and 24.5mm exhaust valves Stainless Steel Valves (21-4N material) 27mm intake port, 23mm exhaust port Race Camshaft V2-2 (TBW0577) Cam Sprocket The combination of the above features in this Race Head V2 deliver huge power gains over the stock basic OEM cylinder head. Port matched to the Race Head V2 Enlarged 26mm port on throttle body side to work better with bored throttle bodies (also works well with stock throttle body) Includes a port matched heat stop to prevent heat transfer to the intake (cannot run a heat stop with the stock intake manifold and some aftermarket head spacers) Includes all mounting hardware Includes a heat sensor extension harness so it can be relocated to the tappet or cam cover. This intake manifold will ensure you will get the most power out of the Race Head V2! Installation requires engine dis-assembly and case boring. Therefore, we highly recommend a professional technician install this kit and the cases bored by a reputable machine shop. Its also recommended that a professional technician make sure its tuned properly once installed. An aftermarket fuel controller is required and possibly an autotune will be needed to prevent a lean condition and damage to your engine. Additionally, a performance exhaust is also recommended as the stock exhaust is restrictive and may cause your engine to run hotter. This product is legal for closed-course competition use only; for racing vehicles (a competition vehicle not used on public highways). Intended for off-road use or race purposes; may not meet regulations of pollution controlled roads or highways. Not legal for vehicles registered and used in California.